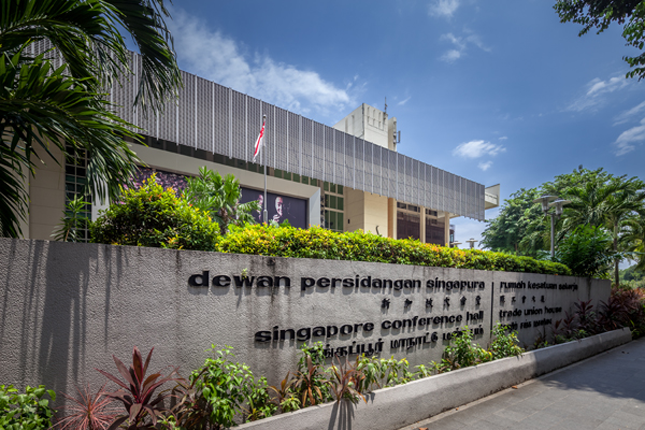 The Former Singapore Conference Hall and Trade Union House was constructed to house the headquarters of the National Trades Union Congress (NTUC) as the fulfilment of an election promise, as well as to host various exhibitions and conferences. Closely linked to Singapore’s history, the avant-garde building witnessed several significant events in the post-independence years. Singapore in the 1950s, characterised by a dynamic and militant labour movement, saw a series of protests and strikes that culminated in the Hock Lee Bus Riots in 1955. During the 1959 General Elections, the People’s Action Party (PAP) proposed the merger of trade unions and the construction of a headquarters for the unified unions as part of its five-year plan. In 1960, soon after PAP’s landslide victory, the newly elected government set up a planning committee – headed by Minister of Labour and Law K. M. Byrne – to look into the building of a trade union house. A three-acre parcel on Shenton Way, located in the heart of Singapore’s commercial zone, was selected as the site for the headquarters. In 1961, the leftists in the PAP broke away in 1961 to form Barisan Sosialis. The Singapore Trades Union Congress, which was the existing trade union organisation at that time, split into two factions: the pro-PAP NTUC and the pro-Barisan Singapore Association of Trade Unions (SATU). NTUC supported PAP’s stance that it would be in Singapore’s best interests to join Malaysia. 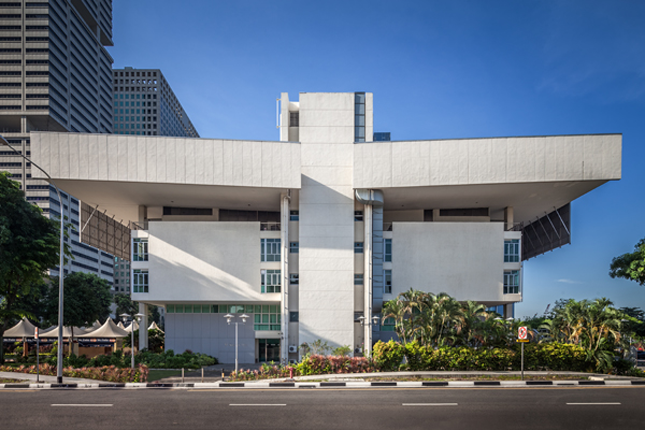 Designs for the new trade union house were sought in an open competition launched on 14 June 1961 – the first major open architectural competition in Singapore since the Japanese Occupation (1942–1945). A total of 16 entries were received. The winning design was submitted by three local architects from the Malayan Architects Co-Partnership, namely William Lim, Chan Voon Fee, and Lim Chong Keat. All the designs and proposals were exhibited in Victoria Memorial Hall in March 1962. Similar competitions were held subsequently, including that for the design of the Civilian War Memorial. On 8 August 1962, M. S. Munusamy laid the foundation stone of the new building. Munusamy was a school janitor who was randomly chosen from 42 rank-and-file workers and trade unionists to represent the common workforce in Singapore to which the building was dedicated. Samsui women, who hailed from Guangdong Provinc, China, and worked as labourers in the construction industry, began work on the building shortly after. Construction was completed in 1965. The building comprised two sections: the Trade Union House and the Conference Hall. The former had a canteen and offices for the NTUC Secretariat and unionists. The latter housed an exhibition venue, an auditorium with a seating capacity of 1,000, a press room, rooms for radio and broadcasting facilities, and office spaces. Prime Minister Lee Kuan Yew officially opened the Singapore Conference Hall and Trade Union House on 15 October 1965. The occasion coincided with the International Labour Seminar, which was attended by representatives from various Afro-Asian countries. More than 1,000 guests were invited to the opening ceremony, including 13 delegates from the Malayan and Borneo territories. Subsequently, the building was chosen as the venue for many of Singapore’s milestone events. In 1971, the heads of delegations of the Commonwealth member states convened at the Singapore Conference Hall for their biennial conference. This was the first time that the Commonwealth family met outside of London, their traditional meeting place. The building also hosted grand celebrations, including the State Banquet in 1969 to celebrate National Day and the 150th anniversary of the founding of Singapore as a British colony by Sir Stamford Raffles. National Day Rally speeches were also given at the Singapore Conference Hall, as well as presentations of the National Day Awards from the 1960s to the 1990s. The election of the first directly elected President of Singapore was held there in 1993. The Former Singapore Conference Hall and Trade Union House was designed in the Modernist style. Its daring architecture embodied the hope and courage of Singapore as a fledgling nation in its post-colonial years. Modernist elements such as a cantilevered roof and terraces are incorporated into the building. Its architecture also expresses local identity through the use of vernacular construction materials like local timber for the walls and ceilings. The monument was also well adapted to the tropical climate in Singapore. Before land reclamation, the building’s orientation and location next to the seafront allowed it to catch the sea breeze. Local hardwood was also used to make sun-breakers to shield the interior from sunrays. The butterfly roof – two roof planes sloped to form a V-shape – enables rainwater to be channelled to and drained via the downpipe in the middle. Malayan motifs are also incorporated to decorate the building. For instance, mosaic tiles with Malay mat patterns cover the walls inside the monument; similar tiles were commonly used in local homes during the 1950s. In 2000, NTUC was relocated to its new premises on Bras Basah Road. The Government then leased the Former Singapore Conference Hall and Trade Union House to the Singapore Chinese Orchestra (SCO), which still occupies the building today. 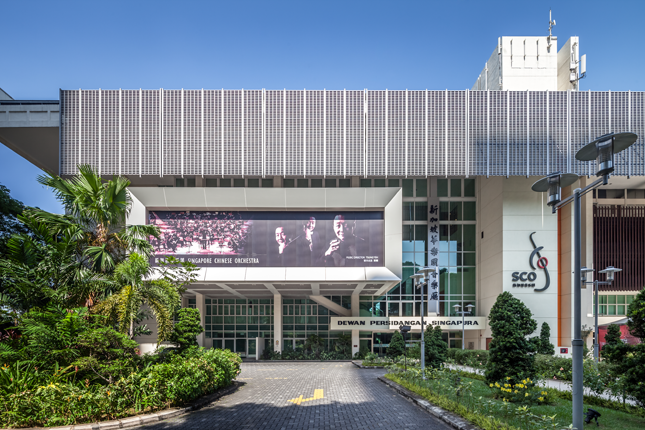 Formed in 1997 to promote Chinese orchestral music both locally and abroad, SCO is the country’s second national orchestra after the Singapore Symphony Orchestra (SSO, established in 1978), which is based at Victoria Concert Hall. 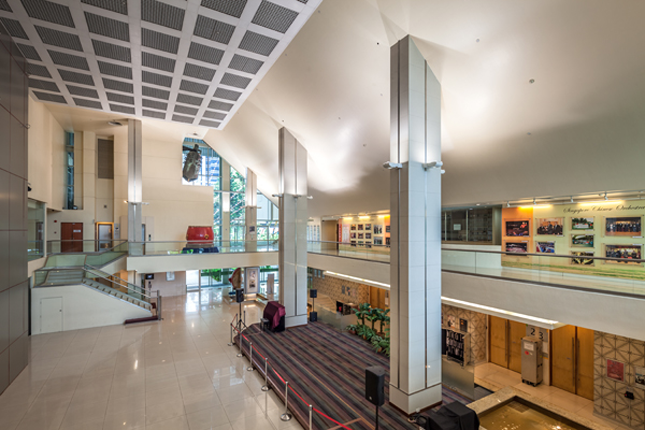 The Conference Hall underwent a major renovation costing S$22 million to be upgraded and transformed into a suitable home for SCO. The Former Singapore Conference Hall and Trade Union House is the first post-colonial building that has the honour to be gazetted as a National Monument.